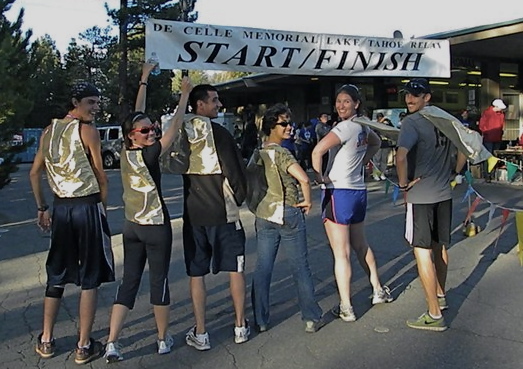 Super-villains have capes, and so did our Lake Tahoe Relay team. Who’s your favorite super-villain? Is there one bad guy who you’ve always been fascinated with? Runners and super-villains have a lot in common. In fact, I’d say that the best runners would make the best super-villains. I’d go even further to say that we runners could have a lot to learn from the best super-villains. Super-villains set lofty goals. Magneto, of the X-men universe, wants to protect the world’s super-powered mutant race from being regarded as sub-human. He pretty much wants to change the way the entire world thinks – I’d say that’s a lofty goal. Good runners set impressive goals, too. Our goals could be finishing a race, finishing a race quickly, hitting a weekly mileage goal, or something else. Good runners set tough, but realistic, goals. Super-villains believe that, through hard work, they can get anything they want in life. Syndrome, from the 2004 animated film The Incredibles, was slighted by the main character as a child. Syndrome spent the next several years of his life plotting revenge and building an enormous robot, Omnidroid, to defeat his new nemesis. Runners set goals, and then, through hard work and dedication, train to achieve them. We run, then run, then run more. We run sprints. We run hills. We run short distances. We run long distances. Some of us occasionally cross-train. Runners and super-villains both know that hard work pays off, and the only way to get the results we want is to work at it. Strong runners and strong super-villains have strong work ethics. Super-villains will prepare for years to execute a cleverly-crafted plan. In the first Harry Potter book, Voldemort, whose end-goal is to kill the titular character, tries to do so by concocting an elaborate plan: borrow someone else’s body to steal a magical device, which he will then use to create his own, new bod, which he will then use to kill Harry. Complex. Runners’ plans are sometimes just as elaborate. We prepare for months, and sometimes years, for our races. Some of us have carefully regimented training schedules. In addition to training almost every day of the week, runners pay attention to the details: we read course descriptions and race reports. We pour over weather forecasts and course maps. We prepare mental strategies to help us through difficult parts of the race. Super-villains have backup plans. Wile E. Coyote’s backup plans are numerous, and, despite their regular failure, he doesn’t hesitate to try again. When I crewed for Badwater, my runner had two full minivans of contingency plans. These plans included extra socks, several pairs of shoes of different sizes, boxes of medical supplies, crates of different snacks, gels, and bars, extra shirts, batteries, headlamps, iPods, chargers, GPS devices, radios – you name it. He was prepared for anything. Super-villains ask for help. Darth Vader, of Starwars fame, was very willing to delegate tasks to his loyal, highly-motivated Stormtroopers. He somehow managed to recruit, and train an entire Imperial Starfleet of Stormtroopers, who would follow along with his plan. Are solitary . They prefer to work alone, instead of relying on teammates. Use their talents rarely. They don’t keep their abilities in top condition, instead opting to save them for emergencies only. Are reactive. They wait until bad things happen, then try to solve the problem, rather than anticipating potential pitfalls. In summary: super-villains would make awesome runners. And runners: we could do worse than looking up to some of the bad guys. Who’s your favorite super-villain? Is it Jafar because of his awesome hat? Or Goldfinger because of his strategic shenanigans? Which bad guy inspires you? This entry was tagged badwater, Boston, california, Costume, crew, crosstraining, goals, insights, inspiration, marathon, pacer, race, Relay, solo, Super-villain, Tahoe, training. Bookmark the permalink.